I SHALL SHOOT ALL MY ARROWS THIS YEAR! And he said, ‘Take the arrows’. And he took them. And he said unto the king of Israel, ‘Smite upon the ground’. And he smote thrice, and stayed. And the of God was wroth with him, and said, ‘Thou shouldest have smitten five or six times; then hadst thou smitten Syria till thou hadst consumed it; whereas now thou shalt smite Syria but thrice” (2 Kings 13:15-19). Wow! Boldly declare 7 times now: “I SHALL SHOOT ALL MY ARROWS THIS YEAR! I CANNOT BE LIMITED!” Note that the WORLD ANOINTING NIGHT of this year also tagged: “WORLD ANOINTING NIGHT OF 12 PROPHETIC ARROWS!” It’s going to be an uncommon prophetic night of action and demonstration of God’s power in settling the 12 months of this year/beyond. THESE ARE NOT PHYSICAL ARROWS! Just like in the physical, in spiritual warfare, arrows are weapons of war in the hands of every believer. You cannot afford to be on the defensive this year; you must be on the offensive! Every arrow you shoot shall arrest, paralyze, displace, and destroy the fortitude and stronghold of the headquarters of your enemies this year! Your 12 prophetic arrows shall be arrows of the LORD’s salvation healing, deliverance, open doors and breakthroughs. Hear this: Satan does not want you to shoot all your arrows this year, because the arrows are a BOMB against his kingdom. He wants you to pray without getting to BREAKTHROUGH POINT! He wants you to shoot INSUFFICIENT ARROWS! He wants you to serve God with a LIMITED ZEAL – half mind – NOT HOT NOT COLD – LAXITY IN ZION! Oh Yes! He wants you to shoot INSUFFICIENT ARROWS! There are people who stop sowing financial seeds just before they reach their harvest point! They grow discouraged and stop! They say, “but I have been sowing and praying without physical results, so why should I do them again?” Yes! They stop sowing or they stop fasting! Ah! INSUFFICIENT ARROWS! Resist that temptation this year! King Joash shot three arrows instead of five or six. It was a PROPHETIC ACTION, but those five or six arrows would have completely consumed and devastated Syria! Yes! Five or six arrows of total victory, but he missed it. HE MISSED IT BY JUST TWO ARROWS – HE SHOT 3 TIMES, INSTEAD OF FIVE OR SIX TIMES! Some people miss it by just one or two years! They give up before their GLORY SEASON! They refuse to wait any longer! They complain and quit Oh! INSUFFICIENT ARROWS! I prophesy: Any plan to make you GIVE UP SHOOTING YOUR ARROWS just before your GLORY SEASON, SCATTER NOW in Jesus name! Any plan to make you STOP AT YOUR “STORY SEASON” without reaching your GLORY SEASON” must D-R-Y NOW by FIRE! As you prophetically shoot your arrows AT THE WORLD ANOINTING NIGHT OF 12 PROPHETIC ARROWS, and sow you STORY TO GLORY SEED (STGS), you will move from STORY TO GLORY as you also pray the GLORY PROPHETIC PRAYER PSALM which will be sent to you (WHATSAPP LINES PREFERABLE), Yes! As you issue prophetic instructions, village, etc, the earth will fight for you and swallow up every enemy of your promised glory this year in Jesus Christ name! Amen! Pray seriously now! 1. Psalm 92:1; LORD, I thank you for your grace that has kept me in this fasting program till date. 2. Psalm 89:52;I bless Your name for Your faithfulness, protection and preservation concerning my life, family and ministry. 3. Psalm 19:14; LORD, let the words of my mouth and the meditation of my heart be acceptable in Your sight O Lord! TAKE SOME PRAISE/ WORSHIP SONGS NOW TO YOUR GOD. 4. Thou sure mercies of God, locate me today. I receive grace to shoot all my arrows now in Jesus name. 5. LORD, I shall not serve You with a diluted or half mind this year, but will serve You genuinely from my heart in Jesus name. 6. Rev. 12:10; Every satanic accusation meant to hinder me from shooting all my arrows this year, scatter and backfire now in Jesus name. 7. Vs 10; Abba Father! My hands shall not be weakened through satanic accusations this year in Jesus name. 8. O God, I command whatever was programmed to make me misfire and misdirect my arrows in this fasting program to catch fire and burn now in Jesus name. 9. Psalm 22:7; LORD, my enemies shall not have occasion to laugh me to scorn this year, I shall appear in Jesus name. 10. Vs 7; O you satanic lips targeted at my GLORY SEASON in this fasting program and beyond, be cut off now by fire in Jesus name. 11. Vs 7; Satan, you cannot shoot out your lips, inflict terror, evil and wickedness against my life, family and ministry because you have lost the battle today and at the World Anointing Night in Jesus name. 12. Vs 7; You satanic lips speaking and enforcing GROANING into my destiny instead of GLORY this year, now be cut off asunder by thunder in Jesus name. 13. Psalm 11:2; O God, arise on my behalf this year, let the bow and arrow of the wicked turn around to destroy them in Jesus name. 14. Vs 2; LORD, let those that blend their bows and sharpen their arrows of every determined enemy in Jesus name. 15. Vs 2; LORD, I released my DIVINE PROPHETIC ARROWS now and at the WORLD ANOINTING NIGHT to shoot, scatter and destroy the arrows of every determined enemy in Jesus name. 16. Vs 6; LORD, let the portion of their cup be a horrible tempest and let their feet become slippery and their habitation become desolate by fire in Jesus name. 17. Vs 6; MY FATHER! Rain coals, fire and brimstone upon those set to frustrate my efforts in this year of my glory now by just thunder in Jesus name. 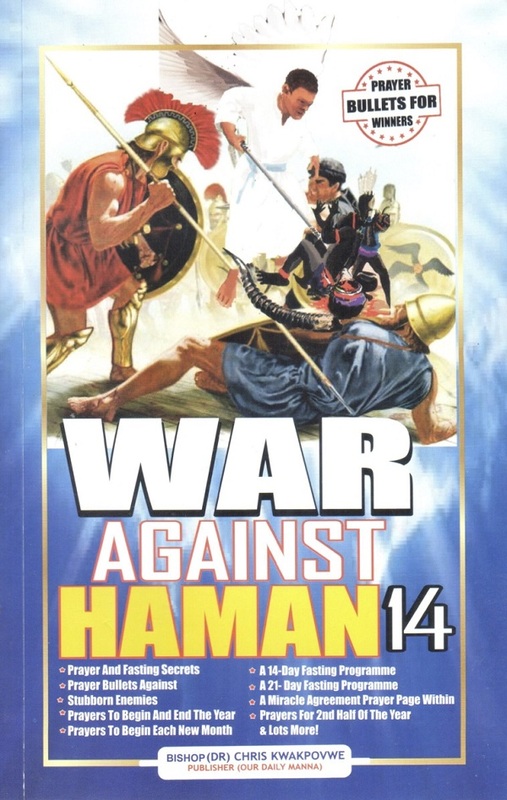 War Against Haman 14 DAY 13 AND DAY 14 – I SHALL SHOOT ALL MY ARROWS THIS YEAR! 18. Ezekiel 36:8; LORD, as I shoot my arrows today and at the World Anointing Night, my life and ministry shall break froth on every side and the world shall see my manifested glory in Jesus name. 19. Vs 8; O God, I shall not be a victim of INSUFFICIENT ARROWS this year! I SHALL SHOOT ALL MY ARROWS THIS YEAR and my business, career and job shall come alive again and I shall not be “once-upon –a-time” in Jesus name. 20. Vs 8; O LORD, I shall not be a victim of INSUFFICIENT ARROWS this year! As I shoot all my arrows today and at the World Anointing Night, I shoot forth to limelight the star of my marital and financial destiny in Jesus name. 21. Vs 8; I shall not be a victim of INSUFFICIENT ARROWS this year! I refuse to QUIT trusting just God! I shall complete this fast and look to my God till my STORY changes to GLORY! I SHALL HOLD ON IN JESUS NAME! 22. I shall not be a victim of INSUFFICIENT ARROWS this year! I shoot forth the arrows of fruitfulness, prosperity, the promotion, success and faster progress to locate all my affairs and endeavours in this 2019 and beyond in Jesus name. War Against Haman 14 DAY 13 AND DAY 14 – I SHALL SHOOT ALL MY ARROWS THIS YEAR! 23. Psalm 58:6; I shall not be a victim of INSUFFICIENT ARROWS this year! My Father! My Father!! Break the teeth of the bow and arrow of every satanic bow and arrow targeted at my family and household by fire and thunder in Jesus name. 24. Vs 7; You powers shooting evil arrows of confusion, fear, anxiety and depression in order to distract me from my glory hour, catch fire in Jesus name. 25. Vs 5; I shall not be a victim of INSUFFICIENT ARROWS this year! LORD, my enemies will not use me as their encouragement this year, because my life shall disappoint them daily in 2019 in Jesus name. 26. Vs 7; O God, through my 12 prophet arrows, let my haters be WOUNDED SUDDENLY. Give my mockers an incurable plague by fire in Jesus name. 27. Vs 7; As I continue this fast and beyond, shoot Your arrows! HOLY GHOST, WORK THROUGH EACH PROPHETIC ARROW AND SEND EVERY ENEMY OF MY GLORY ON A MISSION THEY WILL NEVER RETURN FROM in Jesus name! 28. O God, break the pride and confidence of every secret Ahithophel and Absalom. Decorate them with shame in Jesus name. 29. King Joash shot three arrows instead of five or six. I shall not quit before my GLORY HOUR this year! I refuse to be a victim of INSUFFICIENT PRAYERS, GIVING, TRUSTING, WAITING ON GOD, etc. 30. Psalm 18:14; “Yea, He sent out His arrows, and scattered them; and He shot out lightnings, and discomfited them. “O God, I shall shoot all my arrows this year and the foundation of poverty shall be rooted out by thunder in Jesus name. 31. 2 Kings 13:17; I SHALL SHOOT ALL MY ARROWS! O LORD, let my 12 prophetic arrows that I shall shoot this year become arrows of THE LORD and arrows of great deliverance for me and my household in Jesus name. 32. Vs 17; LORD, as I shoot my arrows, let the power of untimely death be demolished by fire and thunder now and at the WORLD ANOINTING NIGHT OF 12 PROPHETIC ARROWS. 33. Vs 19; O God, I SHALL SHOOT ALL MY ARROWS! My glory shall not be short-lived; my victory, triumph, celebration and dancing shall not be cut short in Jesus name. 34. Pray and declare now: “I shall not be a victim of INSUFFICIENT ARROWS this year! O God, as I shoot all my arrows of prayer, patience and purity this year, there shall be peace in my marriage promotion in my office, success in my academics and prosperity in my business and career. I shall recover all that the enemy stole from me. Evil arrows shall backfire and my prophetic arrows shall invade the camp of the enemies and fight for me and my household daily this year. I shall not misfire my arrows and I shall not miss my breakthrough season! The enemies of my GLORY LAND shall go down by fire, their arrows and evil agenda shall scatter and I shall arise and shine because this year is my YEAR OF GLORY. I am moving from STORY to GLORY! I shall see RESULTS that will cancel INSULTS, BLESSINGS that will terminate and disgrace CURSES, PROMOTION that will paralyze DEMOTION, INCREASE that will expire DECREASE, ACCELERATION that will disdain DECELERATION AND SUCCESS that will shame FAILURE! The world shall know that I serve a mighty God in the name of Jesus Christ of Nazareth! 35. I shall be established in righteousness this year. I AM MOVING FROM STORY TO GLORY THIS YEAR! Because the LORD OF GLORY is my God, my GLORY shall not elude me this year. Every area of my life and ministry shall manifest the undaunted GLORY of my God in Jesus name. 36. Prov. 23:18 – In Your Own Words, Pray Seriously About Your Personal 2019 Prayer Points And Expectations Now! They Shall Not Be Cut Off in Jesus name. Amen! (Bring them to TBS). War Against Haman 14 DAY 13 AND DAY 14 – I SHALL SHOOT ALL MY ARROWS THIS YEAR! 37. Pray about the 12 months of this year a led now: ENOUGH IS ENOUGH! This is my year to move from STORY TO GLORY! My GLORY LAND must locate me in January, February, March… (Mention all the remaining months of 2019). 38. As I sow my STORY TO GLORY SEED (12PROPHETIC ARROW SEED) by faith, and pray the SPECIAL “GLORY-PROVOKING PROPHETIC PSALM” (GPPP), which I will pray for 5 weeks every satanic anger or wicked rage against my destiny shall end up in SHAME in Jesus name. 39. Ecc 11:4 – “He that observeth the wind shall not sow; and he that regardeth the clouds shall not reap”. “I reject DISCOURAGEMENT in SEED SOWING! I refuse INSUFFICIENT ARROWS IN SEED SOWING this year! I refuse to allow battles or DELAYS of the past to stop my SOWING AGAIN this year! I shall sow my “STGS” – STORY TO GLORY SEED – 12 PROPHETIC ARROW SEED in this fasting programme in Jesus name. 40. As I sow my “STGS” – STORY TO GLORY SEED and receive my SPECIAL “GLORY- PROVOKING PROPHETIC PSALM” (GPPP), which I will pray for 5 weeks, the God of MERCY, who knows the number of hairs on my head, will move me from “STORY TELLING” to “GLORY SHOWCASING” this year in Jesus name. PROPHETIC ARROWS, O EARTH, vomit and release my Glory this year by fire in Jesus name! 42. O EARTH, vindicate me and swallow up every RAGE, ANGER, EVIL VOW OR WICKEDNESS of my HATERS! Swallow up haters of my destiny this year in Jesus name. 43. As I carry out the PROPHETIC ACTION of shooting my 12 PROPHETIC ARROWS AT THE WORLD ANOINTING NIGHT, each for the 12 months of this year, every arrow shall deliver to my life, family and ministry my GLORY LAND in Jesus name. 44. HOLY GHOST, WORK THROUGH EACH PROPHETIC ARROW AND LET THEM DO A PERMANENT DAMAGE IN TH DOMAIN OF DARKNESS! 45. Pray about the WORLD ANOINTING STORY TO GLORY NIGHT NOW! Pray for me, Dr. Chris, and all ministers that will minister that night! 46. Pray for all the types of workers and music ministers of that night! 47. Decree Journey mercies (TO and FRO) for all who will travel from across the globe to Lagos. Bind VISA DELAYS! 48. Bind the spirit of losses, accidents or death. 49. Decree that there will be GREAT JOY in your land after that programme! 50. Thank the LORD for answered prayers and for your STORY TO GLORY testimony this year and beyond in Jesus name! 51. Pray about the WORLD ANOINTING NIGHT service now; scatter every gang up against that night Command every evil hand stretched towards that night to dry up. 52. Pray for ODM workers and ministers for the unction to function that night! 53. Pray for me, Dr. Chris, for fresh fire and more unction to function that night! For unbreakable partnership with my three Friends that night! 54. Pray and loose journey mercies for all who will travel far and wide from across the globe to Lagos that night Loose visas and nullify immigration barriers! 55. Thank you LORD, for answered prayers and for my promised Glory this year and beyond! “YOUR PAST DOES NOT DEFINE YOU! IT PREPARES YOU!” – Darren Hardy. Everything that has happened has gotten you to where you are today. REFUSE TO BREAK THIS FAST NOW! YOUR GLORY SEASON IS NEAR! Amen and amen!! I shall shoot my arrows with faith! !